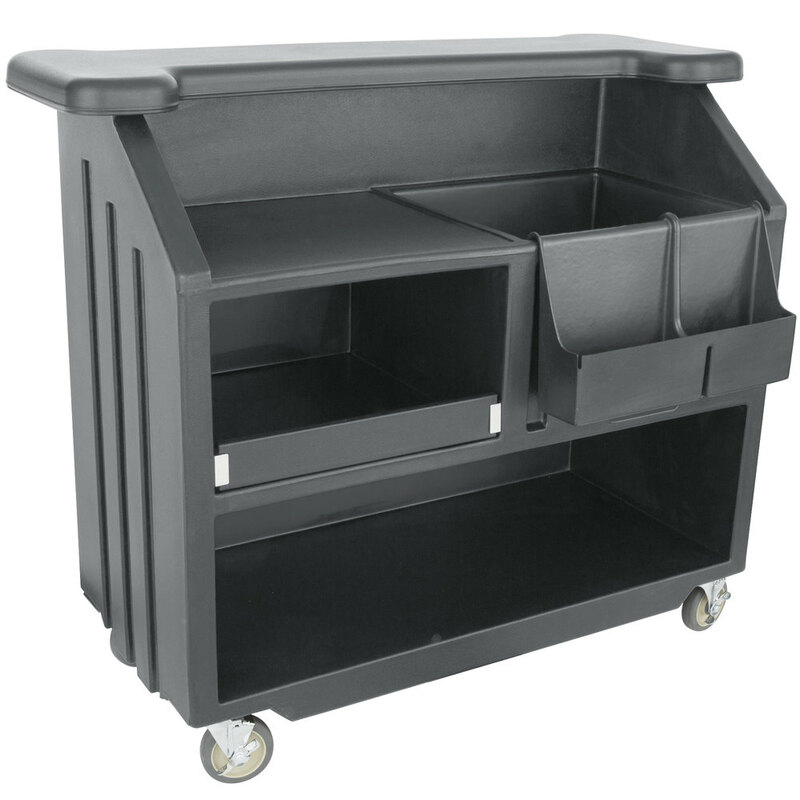 The Granite Gray 54” Cambro BAR540191 Cambar is a stylish, portable, and versatile solution for beverage service at hotels, receptions, banquet halls, or any type of indoor or outdoor catered event! A recessed work area prevents spillage and provides plenty of room for drink preparation, while its deep ice sink holds up to 80 lb. of ice to minimize downtime while retrieving more ice! The 54″ wide Cambar’s high density, double wall polyethylene construction is both durable and easy to clean. Rounded corners and molded compartments help absorb shock, protecting your bottles and glassware during transportation. Take your bar service anywhere with the Carlisle 7550094 Maximizer portable bar. This cherry wood, 56″ bar will blend in easily with any foodservice environment, and comes fully assembled. Designed for easy drink preparation and serving, this bar’s molded countertop is easy to clean and includes a molded-in bar mat well, and its large surface area allows you to keep condiment caddies in reach without blocking the counter. 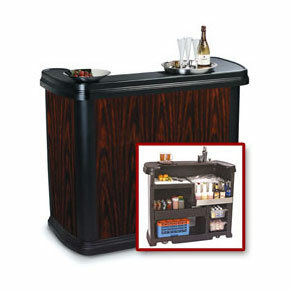 This portable bar also features 5″ non-marking swivel casters with locking breaks to hold the bar securely in place.With lots of storage space, your prep tools, ingredients, mixes, garnishes, ice and glasses are all at your fingertips! A built-in cutting board allows for easy garnish preparation and can be removed for cleaning, while a removable, sliding storage drawer accommodates mixers or sodas. 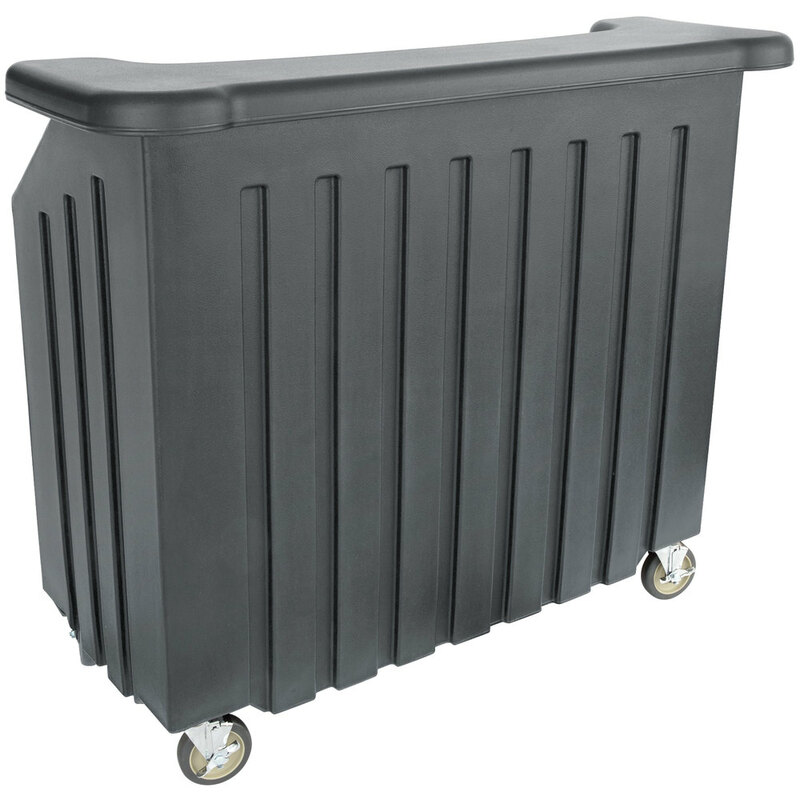 A 15-gallon ice bin features an integrated drain and water trap, and includes a standard dust cover for sanitary storage and transportation. 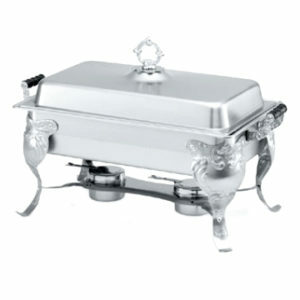 Use this portable bar in your banquet hall, hotel lobby, or for poolside, terrace, outdoor dining and more!